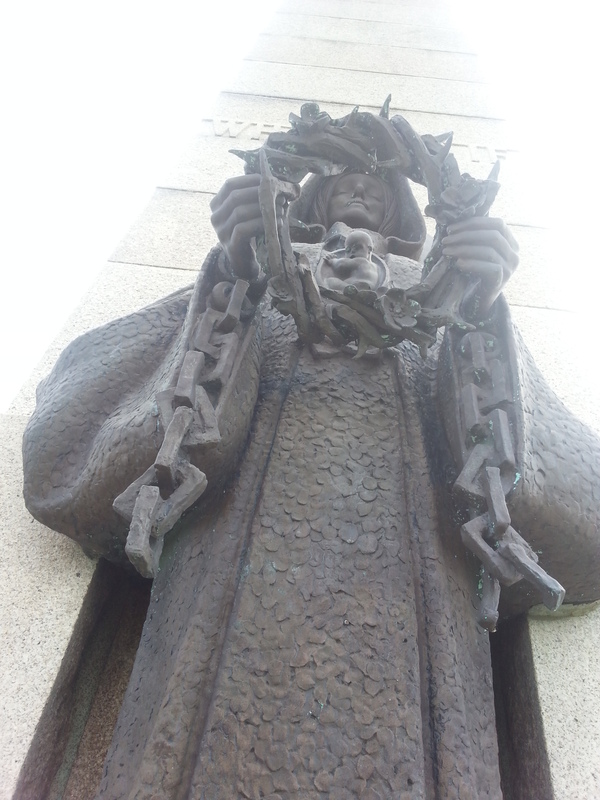 Charles Sargeant Jagger although the son of a collier became a prize winning student whose work won him a travelling scholarship to study in Rome and Venice. 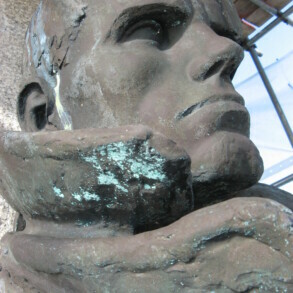 When war broke out in 1914 Jagger gave up his scholarship to join the army and it is his experiences in the army that inform much of his later war memorial work. 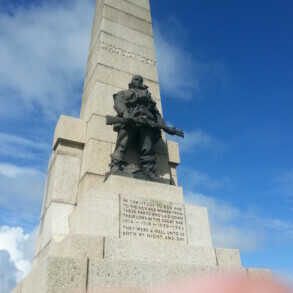 Many war memorials represent idealised slightly romantic portrayals of service men and women, but service both on the Western Front and Galipoli, along with being wounded three times and receiving the Military Cross for gallantry, inform the more rugged realism of Jagger’s work. 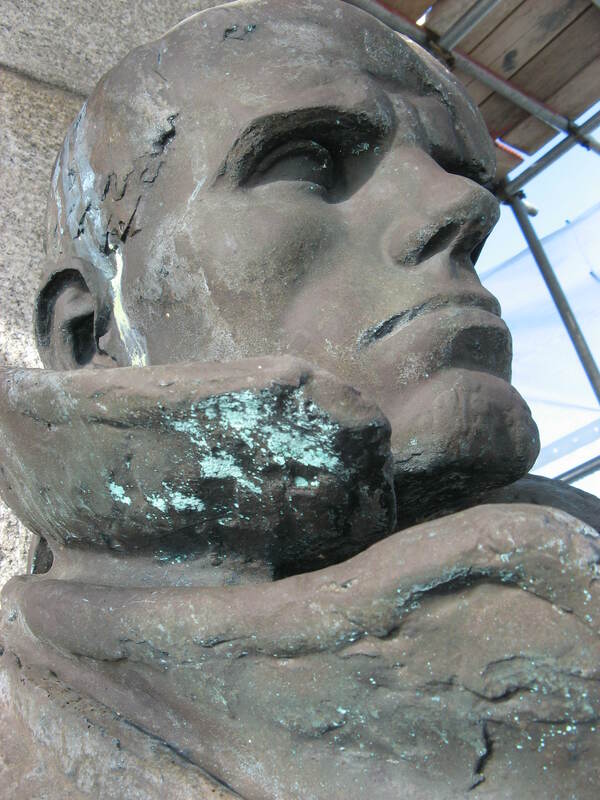 This realism and his more gentle interest in surface qualities are both represented at the impressive war memorial at Hoylake in West Kirby. 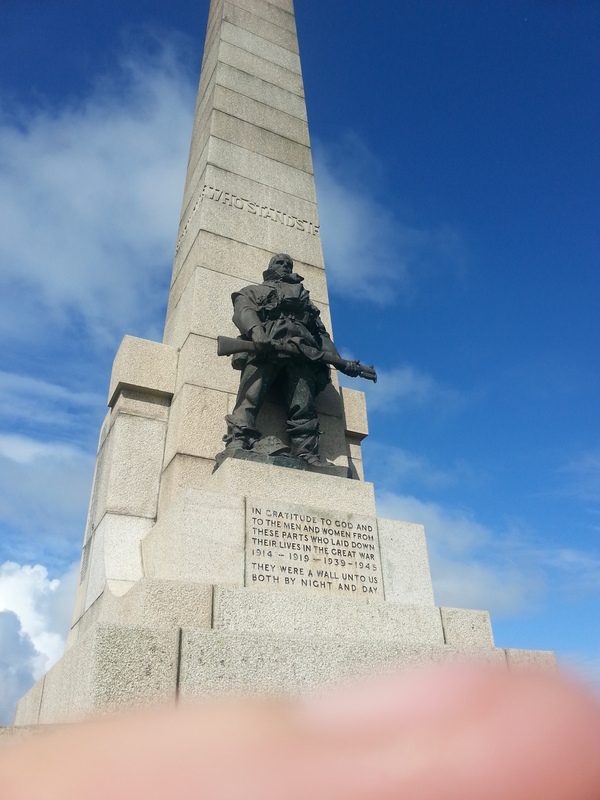 Set on an, at times, bleak and windswept headland the Hoylake and West Kirby War memorial is a massive granite obelisk with two, three metre figures on either side of the memorial. 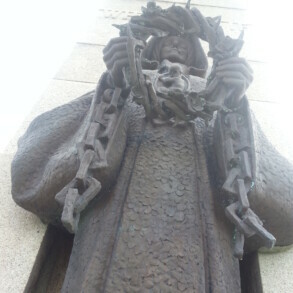 An imposing soldier standing almost on a German helmet, carrying a rifle with a fixed bayonet stands one side and a much gentler figure of a hooded woman, holding a crown of thorns on the opposite face. 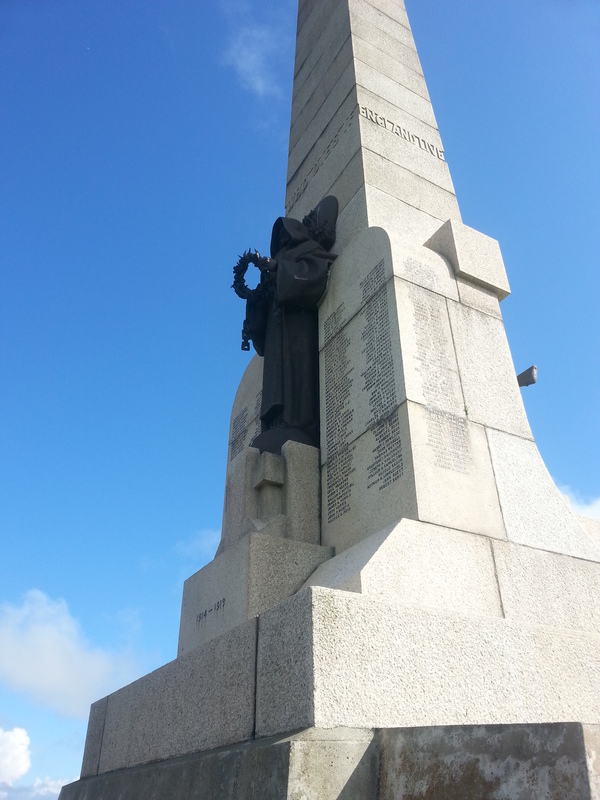 Sadly, the whole memorial has been used as a local playground and has suffered some vandalism in the past. 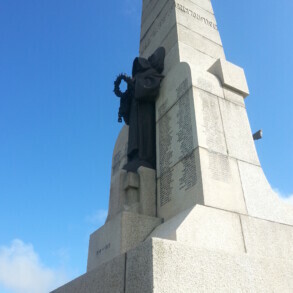 As a consequence, the bayonet is kept separately and fixed in place for memorial services. The blade from the bayonet has been re-made and required patinating in order to match the dark bronze of the soldier. The history of the care of the pieces is uncertain. 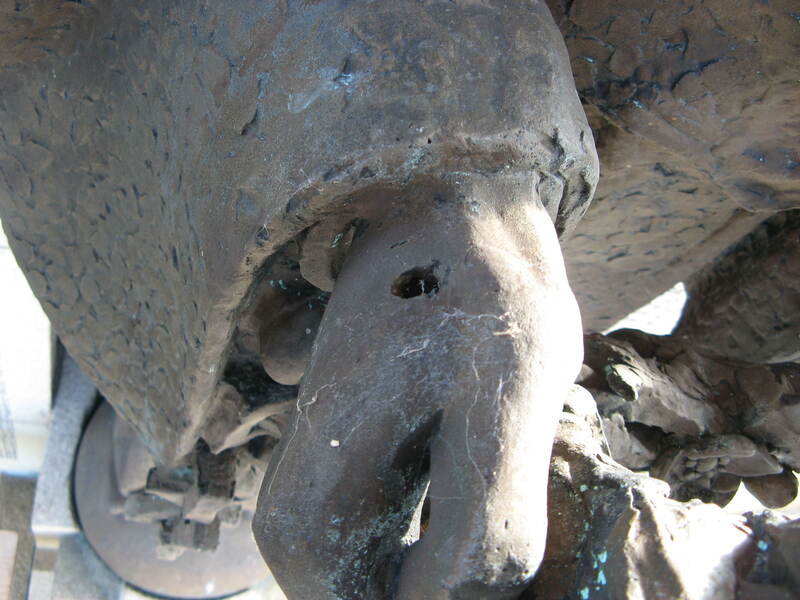 When Eura Conservation’s team examined the figures it was clear that some form of historic paint or lacquer was covering a large amount of corrosion, particularly in the more inaccessible areas between the bronze soldier and the granite obelisk. 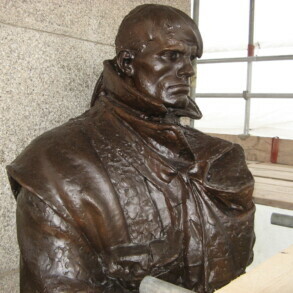 The remainder of the sculpture had been cleaned in the past, although no surface protection had been applied. 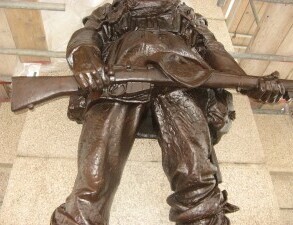 As far as possible the figures were cleaned back using the wet ‘jos’ method of cleaning which is a gentle water borne abrasive system of cleaning. Areas where there was a build-up of corrosion products were hand cleaned to ensure as good a surface as possible was prepared prior to selective re-patination where needed, this was followed by a coat of BTA [benzotriazole] as a corrosion inhibitor and finally several applications of wax both to seal the surface and also also as a filler of the many small holes caused either during the casting process or by corrosion. 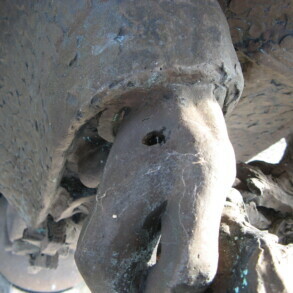 The female figure had less dark historic paint and had an underlying paler patina. This was kept as a reflection of the more gentle depiction of the whole. An historic hole in one of the hands was filled with a bronze gauze substrate with bronze loaded polyester to match the colour and surface texture. 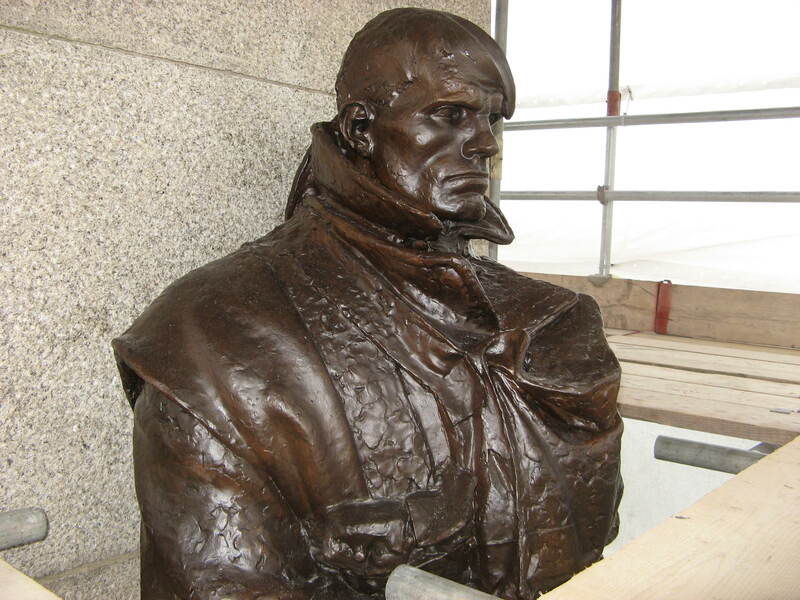 Again the whole figure was treated with BTA and several coats of wax to make a surface which will withstand the gales coming in from the Irish Sea for a good number of years.